INDIANAPOLIS, IN (US), January 2019 — Indiana University-Purdue University Indianapolis (IUPUI) biologists, growing human pluripotent stem cell-derived retinal ganglion cells in the lab, have developed a way to create more-mature models that better mimic the environment in the human retina. By introducing human pluripotent stem cell-derived retinal ganglion cells (hPSC-RGCs) to astrocytes, researchers can create cells that are more analogous to human RGCs and can be further used to study diseases such as glaucoma. These results are published online in Stem Cell Reports. Jason Meyer, Ph.D., an associate professor of biology in the School of Science at IUPUI, is using the hPSC-derived retinal organoids to better understand the development and maturation of retinal ganglion cells. These cells transmit visual information to the brain, and when that connection is disturbed a person loses sight. But RGCs do not exist and function in the retina alone; the astrocyte cells are vital in providing support and instruction to the retinal ganglion cells. "The astrocyte is found in the retina, but very specifically in association with the retinal ganglion cells," Dr. Meyer said. "They are found all around the retinal ganglion cells and throughout the optic nerve connecting to the brain, so we found they have an important role in how these RGCs are developing and functioning." "What we found is that the astrocytes speed up the differentiation and provide a retinal ganglion cell that functions more appropriately and acts more like how we would expect these cells to function in the human retina," Dr. Meyer said. "Glaucoma doesn't develop in immature cells that are still growing; we want to get the cells we study as close as possible to the stage when they start to develop problems," Dr. Meyer said. "Ultimately, what we found is that these retinal ganglion cells do acquire some features of maturation on their own, but we are able to enhance that with the astrocytes." 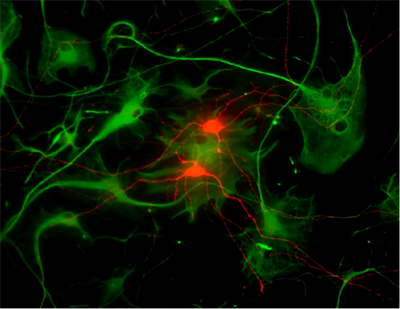 Human pluripotent stem cell-derived retinal ganglion cells, shown here in red, were co-cultured with astrocytes, shown in green. Image courtesy of IUPUI.